If you haven't gotten your flu shot yet...GET YOUR FLU SHOT!! I kept putting it off and now I have the flu. Bleh. Not the worst flu I've ever had, but still wearing me out. I haven't painted my nails since Thursday. It's the weirdest coincidence, but painting myself green and getting the flu seem to go together. It happened in '10 and now it's happened again. If Zeus hadn't caught it too, I'd almost swear it was the paint. Strange. Anyway...I'm rambling. Nichole hasn't asked Rafflecopter for a winner yet (as of the time I'm writing this), so I don't have one to announce. I have to end this month of giveaways with something special. 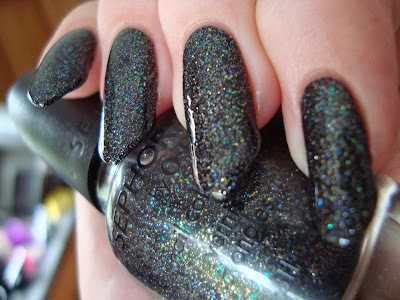 This final prize is a bottle of one of my favorite glitters, Sephora by OPI If You've Got It, Haunt It. It's perfect for Halloween, but great any time of the year. This post is turning into a patchwork disaster, but...oh well. There was just no way I was gonna skip wearing it on my claws! So endlessly glad I reswatched it! I know a lot of people prefer dark polishes on short nails, but I love this even more on long nails than on nubs. So much going on in this polish, all the twinkling blue and green, orange and yellow, and the tiny silver. Can you see why I saved it for last? Aside from the brand being recently kaput, it's also simply....outstanding! I first wore it back in May and fell in love right away. Wow my nails were short! That's about as short as they can be. I don't miss that at all! I meant to give the prize bottle away over the summer, but life had other plans. It was what gave me the idea for Wicked Winnings Wednesday, so it's fitting that it's the final prize. So here we go, the fifth and final chance for Wicked Winnings! Good luck and thanks for entering! This has been so much fun! P.S. - I've got something special planned for closer to xmas. Shh...it's a secret.